HOME / Najnowsze technologie / FAQ / What are the advantages of a SECO/WARWICK roller hearth furnace? What are the advantages of a SECO/WARWICK roller hearth furnace? SECO/WARWICK roller hearth furnaces are designed tomeet your heat treating requirements accurately and economically. There’s a wide range of sizes and types of electric or fuel fired heating systems with matched cooling sections and system components such as charge and discharge tables, quench systems, protective atmosphere systems, cooling equipment and loaders. 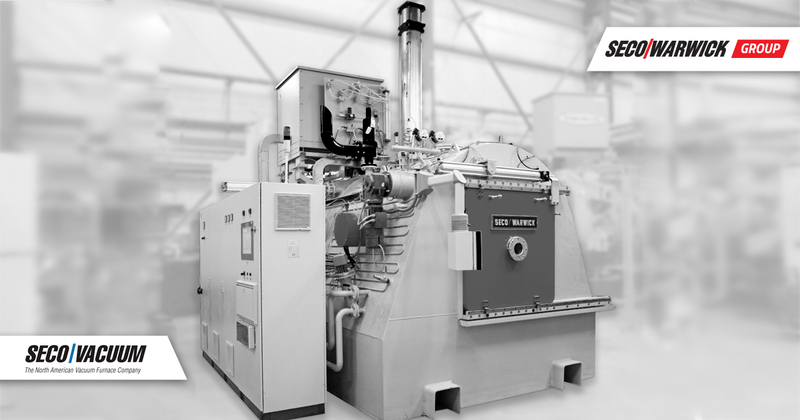 SECO/WARWICK process specialists to select the right combination for your production by configuring the furnace system with a variety of heating and cooling chamber designs, custom engineered to suit your process. The SECO/WARWICK roller hearth conveyor system consists of a series of externally driven rolls. There are no cumulative conveyor pressures or tensions as in belt, chain or pusher furnaces. As a result, there are no production or cycle limitations and the length of the furnace is dependent only upon your application needs. Individual operation of the roll sections permits continuous or interrupted work flow. The advanced constructio design features of these furnaces let you increase both the quality and rate of your production. Individually driven roll sections for fast run-in and run-out, heavy duty insulation systems, welded gas tight casings, temperature-designed doors-all assure fast, accurate, uniform heating and cooling, minimizing atmosphere mixing, heat loss and work distortion or stress. Furnace sections are completely assembled at the factory with insulation, heating systems, piping, wiring and rolls. The skid mounted sections can be moved quickly and easily into place, welded or bolted together and placed in operation. Assembly by highly skilled factory staff using the right tools, jigs and fixtures assures greater attention to workmanship and design details, eliminating many of the problems frequently encountered with field construction. Because individual conveyor rolls are externally driven and remain in the same temperature zones, they are not subject to thermal cycling and can be designed for maximum operation life at working temperatures. In addition, cumulative pressures on conveyor rolls, work trays and work loads are eliminated. Furnace doors are specially constructed and insulated for operation within the temperature zones in which they are located, minimizing stress and warpage caused by temperature differences. Heating and cooling sections incorporate dependable, high quality components for long life operation. Factory assembly of furnace section eliminates many problems often encountered with field construction. Individual roll sections can be started, stopped, reversed or oscillated; they can be run at the same or at different speeds. This permits an operating furnace that produces your required cycle in a minimum amount of space. High speed transfer between sections allows closely spaced work loads or work trays, with separation during transfer through doors, assures optimum use of hearth space and minimizes atmosphere mixing. All door openings can be adjusted to work load heights, permitting faster operation and minimizing atmosphere mixing. The wide selection of furnace combinations and sizes means that you can get the furnace designed for your needs. You can cut costs through increase product quality and rate of production. Factory assembly means lower cost installation and your furnace is in production more quickly. In addition, the best construction materials and design mean minimum maintenance. Cycle annealing produces a tough, uniform structure in steel. Typical applications include improving the machinability of screw machine stock, improving cold working properties of deep drawing stock, and improving impact resistance & fatigue properties of gears or machine parts. In the furnace the steel is heated to slightly above hardening temperature (approx. 1700°F/925°C), cooled quickly to the temperature at which transformation should take place (approx. 1200°F/650°C), held at this temperature until transformation has taken place and then cooled. This furnace may be heated by gas fired radiant tubes or by electric ribbon resistors, and normally has a controlled atmosphere to prevent scaling and surface decarburization. Maximum furnace temperature: 1750°F/950°C. Expensive forged or machined parts can frequently be replaced by copper brazed assemblies of stamped parts. In many cases, the copper brazed parts offer a quality improvement as well as a cost reduction. The copper brazing furnace normally includes an electrically heated chamber with either alloy ribbon resistors or silicon carbide resistors and a water jacketed cooling chamber. Copper brazing furnaces are operated with a reducing atmosphere to prevent oxides from interfering with the brazing operation. Maximum furnace temperature: 2100°F/1150°C. 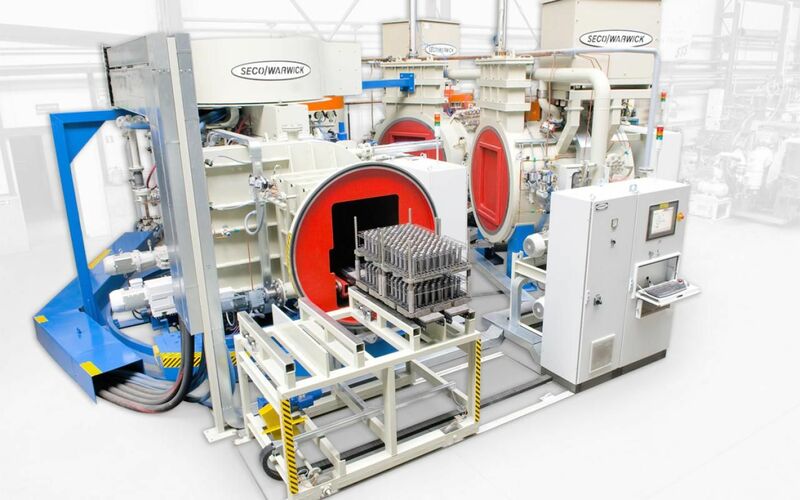 A choice of higher component efficiency or lower costs can be achieved in electric motors, transformers, reactors and ballasts by annealing the magnetic laminations after the last punching, shearing or welding operation has been performed. With almost any magnetic steel, the losses are reduced by this final anneal. The furnace normally includes a burn-off chamber to remove lubricants, a heat and hold chamber, a slow cool chamber and an air blast cool. Heating may be by gas fired radiant tubes or electric ribbon resistors. The furnace is operated with a carefully selected controlled atmosphere. Maximum furnace temperature: 1750°F/950°C. This furnace is used to improve the wear resistance and prevent deformation under impact on gears, crank shafts, camshafts, etc. The parts may be either high carbon hardenable steels or carburized lower carbon steels. 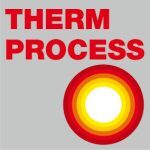 The heating chamber may be heated by either gas fired radiant tubes or electrically heated ribbon resistors. The furnace may be equipped with an integral elevator type quench system or the work may be delivered to hand, die or press quenching. The furnace is designed for operation with non-decarburizing protective atmosphere. Maximum furnace temperature: 1750°F/950°C. Roller hearth furnaces are ideal for full anneal of steel casings to improve machinability. These may also be used for stress relief anneal of castings or forgings. This furnace can be gas fired direct, gas radiant tube or electric ribbon resistor. Water jacketed cooling chambers are designed to cool rapidly, to work with excess air burners, and to improve convection heat transfer at the lower temperatures.